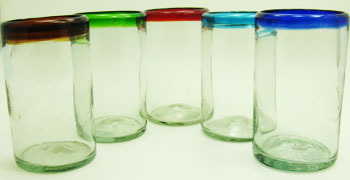 Home > Mexican Glassware > Shop by Glass Style > Tumbler glasses > Tumbler Glass, 16 oz. Very beautiful glasses - I was hoping to find ones that were a little thicker overall (like the ones I'm replacing - several of which have broken over the years) but these are very well made and I love them! Shipping was fast, and they were extremely well packed. I saw these in a restaurant and had to have them. I replaced all my mismatched glasses. Because they are hand blown each one is slightly different. 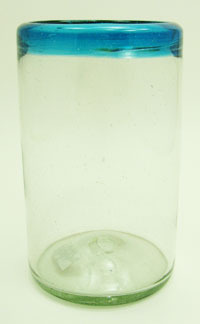 These glasses are made of thick glass(recycled pop Bottles)that can withstand a lot of use. They are wrapped and shipped well so they will not break. I love these glasses as they keep my drinks colder alot longer than some others.I would definately buy these for every day use and are so in style you can use them for nice glassware. These are perfect. I will order more in the future. Thank you! I bought these glasses as a gift for my daughter-in-law, whose name is listed here. Got them with green, blue, and turquoise rims. Arrived quickly and unbroken. She loves them!